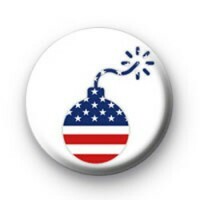 US Bomb badge in white with an American stars and stripes design written across a cartoon bomb logo. This badge is a political statement badge. We have a great range of political badges and politics-themed button badges available on the website so make sure you have a browse through our categories. Standard 25mm badge made by hand in our workshop & available with worldwide delivery.